Structural design is an essential element of the building process, yet one of the most difficult to learn. While structural engineers do the detailed consulting work for a building project, architects need to know enough structural theory and analysis to design a building. Most texts on structures for architects focus narrowly on the mathematical analysis of isolated structural components, yet Building Structures looks at the general concepts with selected computations to understand the role of the structure as a building subsystem—without the complicated mathematics. Profusely illustrated throughout with drawings and photographs, and including new case studies, Building Structures, Third Edition is perfect for nonengineers to understand and visualize structural design. James Ambrose is Editor of the Parker/Ambrose Series of Simplified Design Guides. He practiced as an architect in California and Illinois and as a structural engineer in Illinois. He was a professor of architecture at the University of Southern California. Patrick Tripeny is an Associate Professor, former director of the School of Architecture, and the current Director of the Center for Teaching and Learning Excellence at the University of Utah. He is a licensed architect in California. He has been the recipient of a number of teaching awards at the local and national level for his work in teaching structures and design. 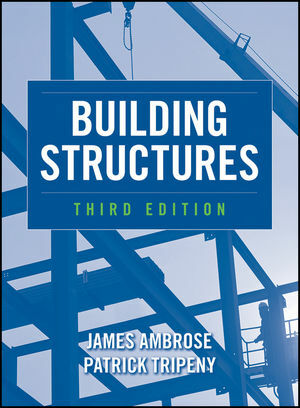 With James Ambrose, he is the coauthor of Simplified Engineering for Architects and Builders, Eleventh Edition; Simplified Design of Steel Structures, Eighth Edition; Simplified Design of Concrete Structures, Eighth Edition; and Simplified Design of Wood Structures, Sixth Edition, all published by Wiley.